Yes, same! Is it blocked as it’s live somewhere else? Or have they cracked down on VPN again? All the kids were excellent. Solid throughout. Thorniley looked so comfortable and Penney was very composed, quick and skilful. Just shows, round pegs and round holes! Shame preston came off, he ran himself ragged and didn’t really lose the ball. Very positive all in all. He’s silent, no emotion.. No coaching, nothing. Clearly we can’t play that formation, yet he persists! He’s making us look a lot worse than we are. It’s not all the players fault. Thorniley and Baker played very well today, why they didn’t start before is another Jos fault. Both look much more capable and solid than anyone else if he persists with wing backs. Pelupessy is that too small/light weight, have to have a physical midfielder there or teams just trounce and over power us. As it was last week, the tactics and player choices makes no sense. Jos doesn’t seem to have clue right now.. he did better when we had no players! 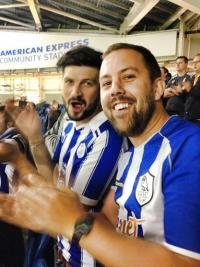 Wigan vs #SWFC match on I-Follow? It is a VPN thing, mine works. PM me if you want know which one. They seem to get shut down when large groups use them and clear they have been on our forum and banned the IP’s. anyone on I Follow ? I have Torguard - it worked intermittently in random locations. But some were very poor quality. We need to find a way to beat this!